Usually near-death experiences and horrific crashes spell the end of a band. 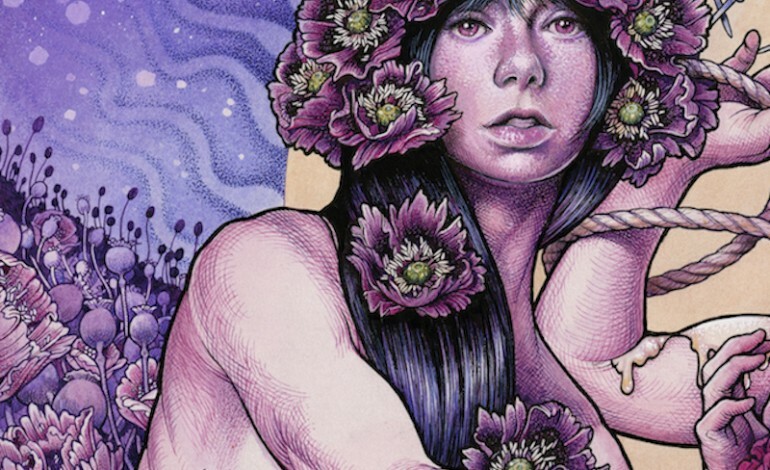 But in Baroness’ case, and despite the amicable departure of drummer Allen Blickle and bassist Matt Maggioni, it proved the prelude to Purple, their most accomplished album since their landmark Red LP. New members Nick Jost and Sebastian Thompson have made admirable contributions and the band sounds re-invigorated and inspired. Which is not to say their previous members held them back — if anything the new blood’s injection of energy and inspiration is made all the more admirable because of Baroness’ consistently superlative production. Opener, “Morningstar,” reminds us of what we’d missed while the band recovered and gelled. Baizley’s increasingly melodic but still-powerful vocals burn atop the kerosene of the dual-guitar harmonies, exquisitely crafted riffs and new drummer Thompson’s flawless sense of pocket and groove. “Chlorine & Wine” begins amidst psychedelic textures of keyboards and synths which appear elsewhere on the record and serve as a reminder that “heaviness” is not just drop-D tuning, Satanism, and doom but can be encapsulated by the textures that enfold a lyric which is equally reflective and assertive—a reckoning with mortality and an assertion of defiant steadfastness. The album is full of the layers, sonic and musical diversity, and thoughtfulness evinced on the band’s pre-crash record Yellow & Green. With the benefit of hindsight we see Baizley announcing himself as a more confident tunesmith and vocalist and the band as an incredibly open-minded musical entity on Yellow & Green. Purple further solidifies this impression in a more compact and digestible package as a single LP. Remaining members from the pre-crash days, guitarists John Baizley and Pete Adams, seem to have learned they don’t need to explore every experimental impulse, new twist and compound in-depth, but can hint at develop and build structures of sound, harmony, and emotion over time but within the confines of a single song. This discipline may have been found as a result of the new perspective of new members or the hard-won maturity of their Bath, England bus-crash and time. The brief and haunting instrumental “Fugue” is an aptly titled interlude in that sense as the contrapuntal compositional structure it names is echoed throughout the album in a number of registers—in the composition, the performances, and the production. It also hints at the other-worldliness that sometimes graces the album. Like the shifting layers of guitars in fourth track “Kerosene,” Purple keeps pushing and pulling, adding and subtracting layers of sound and feeling and what we are left with is the conviction that Baroness has not only emerged from the other side of perdition, but emerged triumphantly with a record that is undoubtedly one of the masterpieces of the decade thus far.